News Source: Japan International Broadcasting Inc. In this series, popular Japanese products are taken apart to reveal the origins of their function and form. The second episode examines the SUPER CUB 50 STANDARD motorcycle. Sixty million units have been manufactured in 15 countries and sold in over 160 countries since 1958. Its Foot Pedal Clutch System enables driving with one hand and the 4-Cycle Engine has stood the test of time. The tires have also contributed to its success. They’re able to restore themselves when punctured. The product reflects the enthusiasm of company founder Soichiro Honda for durability, economic efficiency, and safety. Cumulative worldwide production of Honda Cub series motorcycles*1 reached the 60 million-unit milestone at the end of April 2008. 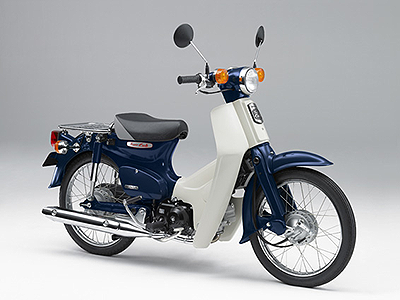 Honda Super Cub C100, first introduced in Japan in 1958, has gained worldwide acceptance both as a business-use motorcycle and for daily transportation, and has been being enjoyed by customers in more than 160 countries around the world. This August will mark the 50th anniversary of launching of Honda Cub series. We introduce Japan companies who produce high quality Japanese products and services. © 2019 JAPAN PRODUCTS: Business Directory of Japanese Companies. All Rights Reserved.